Occasionally, a road trip or mini road-trip is on the agenda. Before setting out on said road trip, my wife and I have a tradition of waking up early to have a great breakfast at some new or familiar location. On this occasion, we were heading to Connecticut to celebrate my niece’s first birthday. My wife took this opportunity to finally get me to try Kitchen (we did try going another time, but it was closed) and as a result we started the trip with a memorable highlight. One owner/chef, one server, and one small restaurant. That’s what you can expect at Kitchen. This is a tiny hole in the wall that seats only a handful of people at a time, which explains the throngs of people waiting outside the restaurant. 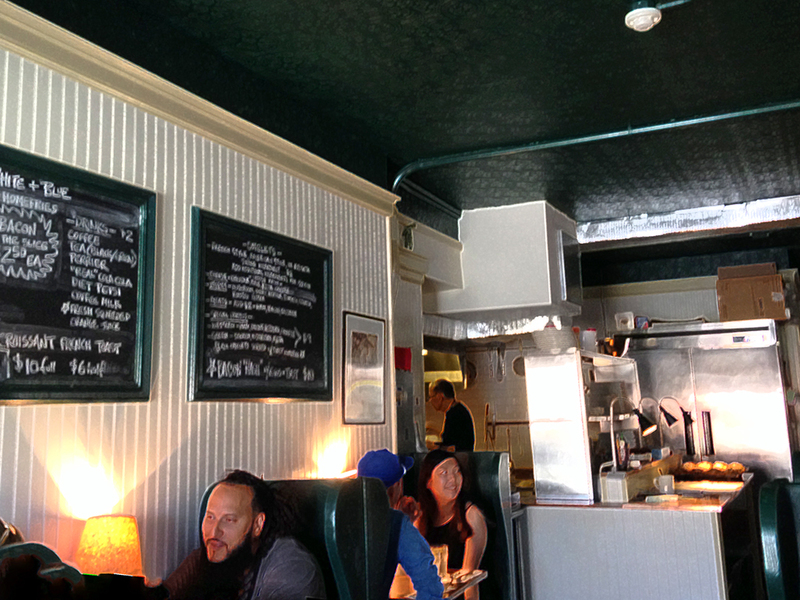 The line of people tells you that even though Kitchen is small, the food is big on flavor. The server is very nice and helpful, but when it comes to finding a seat, the situation is a little tense. Aside from the fact that the seats themselves are somewhat physically uncomfortable for tall or large people, the restaurant could really benefit from a clipboard or just a sheet of paper to allow people to sign in. That way the tension that some other party might steal the next table out of turn is alleviated. In any event, most people are fairly polite about it even if there is a lot of staring through the windows at the diners to see if they are almost done. Everything we tried at Kitchen tasted really good. A lot of the meat-centric dishes came with an original spin on traditional classics. 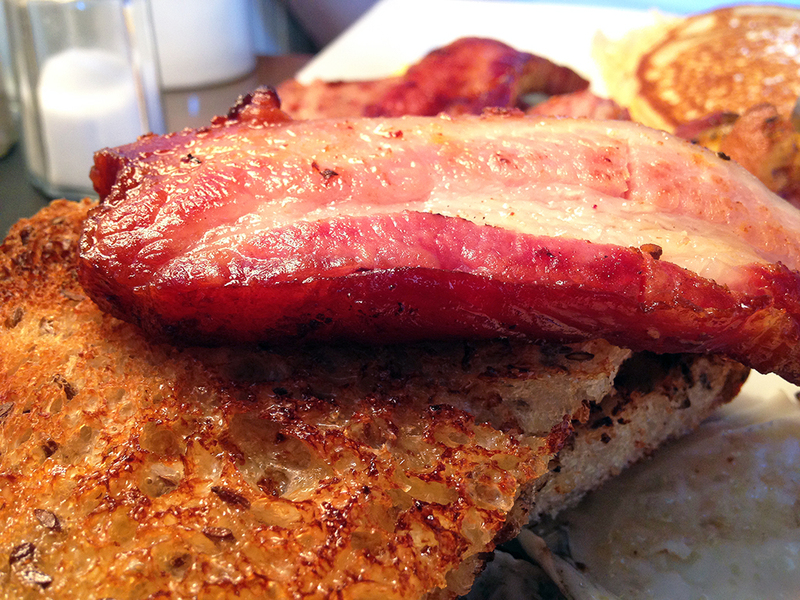 Bacon – This is THE reason to come to Kitchen. The price for a piece of bacon might seem steep at first, but once you see it sitting on your plate, you’ll understand what all the fuss is about. Kitchen serves up a super thick slab of bacon steak as a side dish. It’s just a monster piece of bacon that is slightly sweetened and cooked perfectly considering its size. The outside is crispy and the inside is tender. Big Shot Breakfast (Sausage, Eggs, and Pancakes) – Underneath the extra side of bacon we ordered, my wife had the pancakes, eggs, and sausage. The pancakes were very nicely made because they were fluffy and not too dense. The sausage, while really unique with its spicy cumin inspired seasoning, was probably my least favorite item that we tried. I say, “least favorite,” because everything was good. I just didn’t find this one take on Middle Eastern seasoning to work at the same level as the other items. 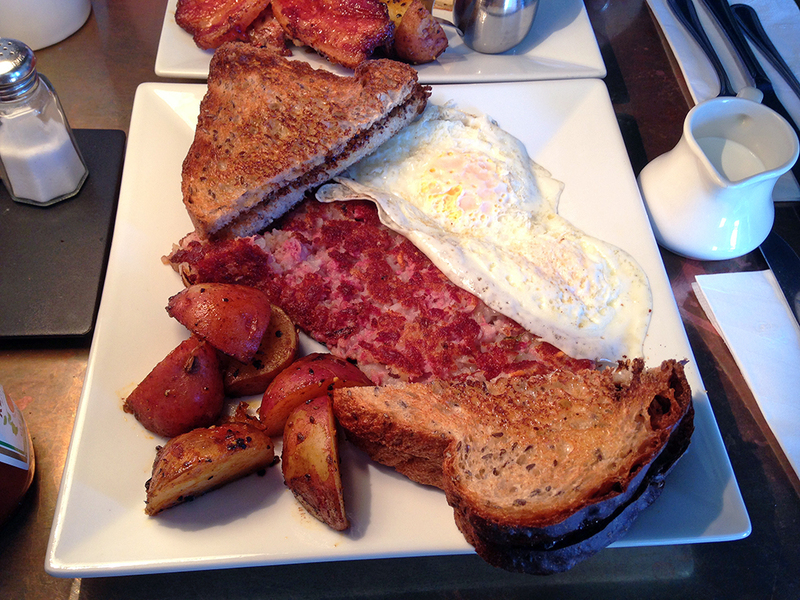 Homemade Corned Beef Hash and Eggs – I’m a sucker for homemade corned beef hash and a great hash can easily become the best part of your day. Kitchen’s corned beef hash was really interesting because it had Middle Eastern flavors in it that reminded me of Kobeba (or Kibbeh), which I love, but would never have thought of as a breakfast flavor. The results spoke for themselves though and I really enjoyed my hash along with the over easy eggs and hearty toast. 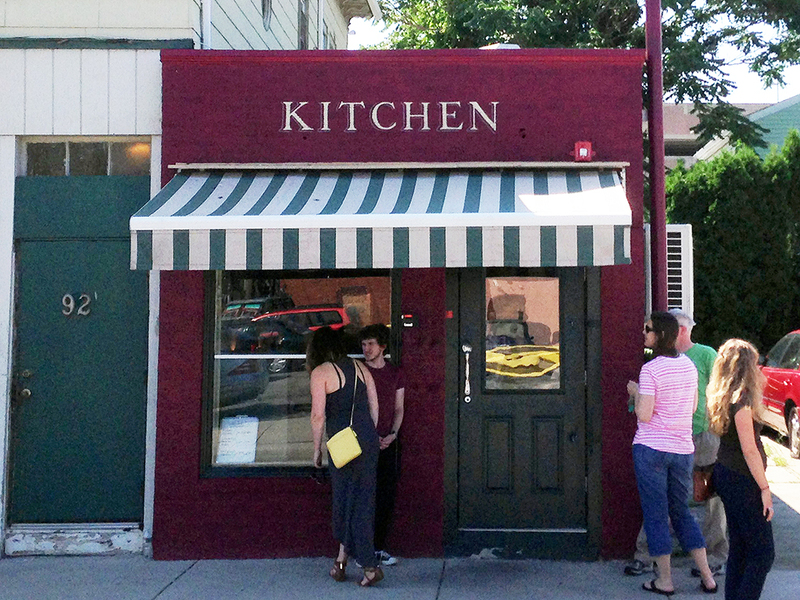 Kitchen is a tiny restaurant serving delicious breakfast food that is well worth the wait as long as you’re not absolutely starving. 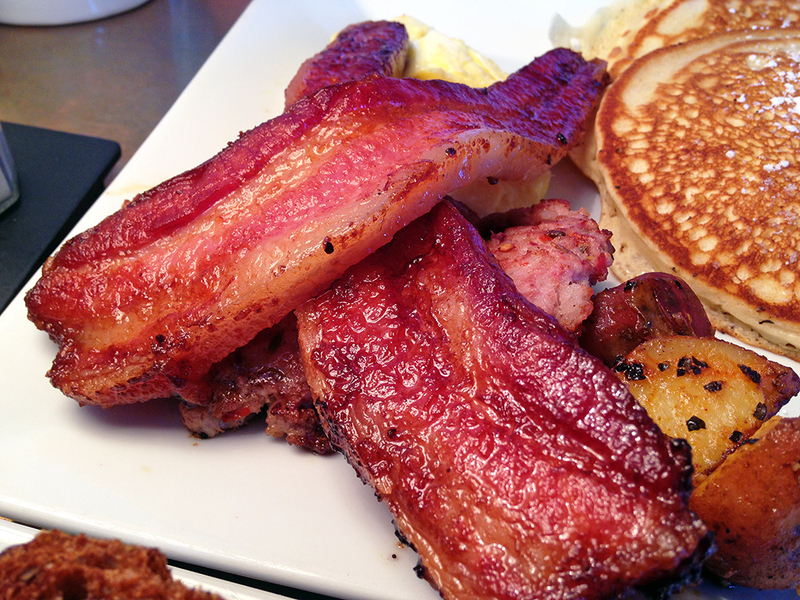 Go early, order the bacon, and enjoy the rest of the day with a smile on your face.